Home Blog Who is Melody McKiver? Soundstreams is thrilled to be working with multi-genre artist Melody McKiver on our upcoming project “Odaanaabag” in collaboration with Jumblies Theatre. Melody McKiver is an Anishinaabe musician, media artist, traditional powwow dancer and artist, and arts educator of mixed ancestry. Melody is an enrolled member of Obishikokaang Lac Seul First Nation on their mother’s side, and their father’s family are settler Canadians of Scottish/Lithuanian origins. Melody currently lives and works in the small town of Sioux Lookout in Treaty #3, northwestern Ontario, and has previously resided in Ottawa, Toronto, and St. John’s NL. As a solo performer, Melody explores the range of the viola’s possibilities, spanning from minimalist to danceable, often incorporating laptop processing and looping. Their most recent release is “Reckoning EP” (2017), which was originally scored for the Article 11 theatre production of the same name and is written for solo viola and electronics. 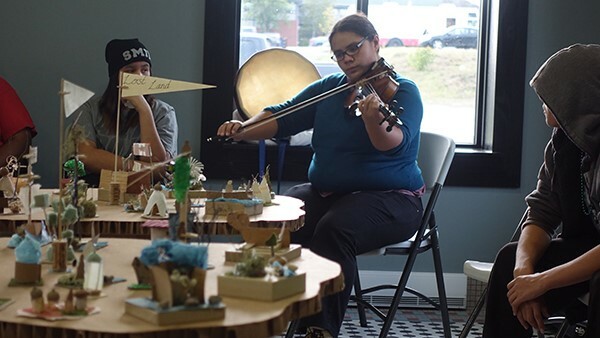 “Four Lands” – Visiting and local artists and diverse community members of all ages and backgrounds create and bring to life their own lands, through a variety of art forms to expresses their relationships. 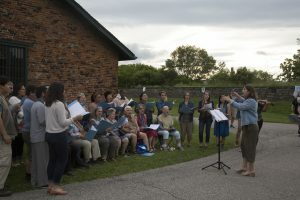 Original song by Melody McKiver sung by community choir (Gather Round Singers), conducted by Shifra Cooper, in Jumblies’ 2017 production of Talking Treaties at Historic Fort York. “Talking Treaties” – An ongoing project that strives to share local Indigenous knowledge and awareness in a hands on, inviting way, by combining interdisciplinary art-making with historical and contemporary content. Within media arts, Melody works with digital video and photography to capture images of Indigenous resurgence, and uses this footage both editorially and within video and sound art. They have also worked on a number of documentary films that are currently in production. Melody’s works “Surveillapocalypse” (2014) and “Ga Waabmin Gaye / Nemolnek Elt Ni’nen” (2014) have been screened and installed in Auckland, Brooklyn, Vancouver, Toronto, and Ottawa. Melody’s musical practice spans across viola/violin, drums and percussion, and guitar, drawing upon a broad set of influences that includes hip-hop, electronic, contemporary classical, jazz, and blues. Melody plays drums with Toronto’s Indigenous hip-hop fusion band Red Slam Collective, frequently collaborates with Colombian-born and Toronto-based musical provocateur Lido Pimienta, and accompanied Cree/Irish trip-hop singer isKwé on a tour of the UK in the summer of 2014. Melody has scored films for directors Mosha Folger and Christian Chapman, composed the score for the Article 11 production of RECKONING, and composed string arrangements for Lakota hip-hop artist Frank Waln. They are a part of the Toronto-based programming collective BOLD AS LOVE, dedicated to the promotion and intersections of Indigenous and people of colour artists and musicians, and the Asinabka Festival committee in Ottawa. Along with Omushkego comedian Darren Sutherland, Melody was the 2015/16 co-host of The Circle on 89.1FM CHUO Ottawa, a weekly radio show devoted to Indigenous music, news, and events. Melody holds an MA in Ethnomusicology at the Memorial University of Newfoundland (2014), with research interests in Indigenous electronic music, artistic processes of decolonization, urban Indigeneity, and Two-Spirited studies. They are a graduate of York University (2010), where they completed a BFA Honours Major in Music, Minor in Race, Ethnicity & Indigeneity as a Member of the Dean’s Honour Roll. Melody has studied classical violin and viola with Peggy Hills, viola improvisation with Matt Brubeck, drum set with Chuck Burrows, and has worked under Dr. Mark Chambers, Mike Murley, Casey Sokol, Lorne Lofsky, Kelly Jefferson, Mark Eisenman, and Dr. Michael Marcuzzi. Melody has performed and recorded contemporary classical, jazz, free improvisation, indie, folk, hip-hop, funk, and reggae at venues and studios in Auckland, Wairoa, and Te Kaha in Aotearoa/New Zealand, London UK, Bristol, New York City, New Orleans, Toronto, Ottawa, Montréal, Québec City, the Electric Eclectics Festival, Banff, Edmonton, Sioux Lookout, and St. John’s NL.